Every day brings with it trials and problems to solve. We have a choice in how we deal with those trials: A. We can worry and fret about them until we make ourselves sick, B. We can bury our heads in the sand and pretend that everything is fine, or C. We can place our problems in God’s hands and trust Him to work it all out. I don’t know about you, but I worry and fret about things all the time and all it has gotten me is high blood pressure and the warning to lessen the stress in my life or I will have a heart attack by the time I am 50. I have tried to live in denial, but eventually problems need to be solved and action needs to be taken. In my life, I have found it so much easier to give it all to God. He is more than capable of dealing with whatever life throws at us and He wants to bear our burdens. He said so in the above passage! God already has the answers to our problems. He wants to bear our burdens and not on a yearly, or monthly basis, but on a daily basis. 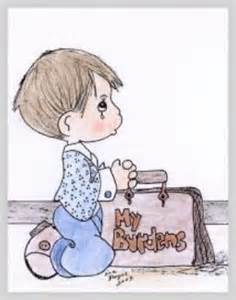 Our heavenly Father wants us to surrender our burdens to Him on a daily basis. For the next 7 days, I challenge you to take God at His word. Every morning when you wake up, surrender your burdens to Him who loves you. Tell Him everything you have to deal with that day and surrender it to Him. Take care of what you need to take care of, as far as that issue goes, but leave the outcome to God. Refuse to let worry or denial cloud your heart and mind. Instead, let the peace of God enter your spirit. I want to hear how this challenge has worked out for you. Are you at peace with the daily struggles of life? 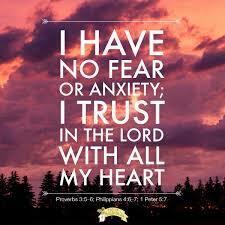 It isn’t always easy to keep worry and anxieties at bay, but trusting God is worth the effort. In chapter 22, God told Abraham to take his son Isaac and sacrifice him to the Lord. Abraham obeyed, and took his son to sacrifice him. Abraham had faith that God would not harm Isaac. God had told Abraham in Genesis 17:19 “Yes, but your wife Sarah will bear you a son, and you will call him Isaac. I will establish my covenant with him as an everlasting covenant for his descendants after him.” Abraham knew that God would not break His promise. God provided the ram to take Isaac’s place on the alter. As a single mom, there have been many nights when I have laid awake and worried about finances. I worked part-time and lived paycheck to paycheck. 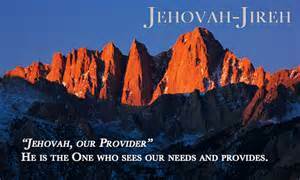 Over the years, my faith in God has grown, as Jehovah Jireh (my Provider) has time and again provided for us. For many years, as the kids were growing up and out of clothes, every time I noticed that one of the kids was in need of clothes, someone would come with a big bag of clothes that fit that specific child. The giver never knew of the need, but God did. I came home from work one day to two big trash bags full of clothes for the girls, who were growing like weeds. I never found out who left them. We always had food. Even though vehicles broke down all the time, I always had transportation. I have been blessed with an ex-husband, who has helped out in many ways. I have always been grateful for a God who provides for His children. I know you are my provider. I come to you now and lay _______________ at your feet. I am surrendering this need to you, Lord and I, like Abraham, trust that you will provide at this time. I give thanks, knowing that you are already at work on my behalf. Thank you, Father. If there is any way I can pray for you, contact me and let me share this burden. I want to remind you that our God is a God of love. He loves you and He will take care of you. Trust Him!